I started planning our trip several months in advance. After doing some research, I found that the best choice for us would be a resort that offers a boat transfer and the FRONT OF THE LINE access. After researching our options, I chose the Hard Rock Hotel. It was a bit more expensive that I had planned on, but it was well worth it. My twin sons (who are now adults) were traveling with my husband and me. They are awesome guitar players and often complain about “guitar withdraw” on vacation. At the Hard Rock, they have the PICK Experience. This allows you to choose from a list of 20 premium Fender guitars, an amp and head phones delivered to your room. 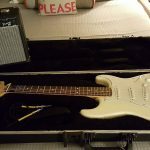 You can exchange your guitar for different ones throughout your stay. They LOVED this feature! Each evening, when we returned to the room, they took turns jamming. 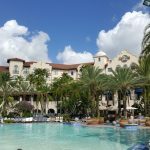 The Hard Rock is a gorgeous resort! It’s especially appealing to the teenage and young adult crowd. There are signed guitars, clothing and memorabilia throughout the restaurants and hallways. There are even framed pieces of rock legend art in the rooms. Of course, you can always hear great music playing even under the pool! 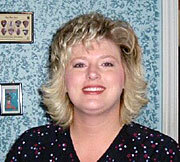 The employees all had their favorite band listed on their name tags. We found it particularly interested to read all of them. The only regret that I have is that we didn’t do the concierge service. Once I saw the price of the food in the parks and City Walk, I think the extra money for the Club Level would have been worth it. Lunches in the park ran over $80 (for the 4 of us)! I did research their dining plans but they didn’t seem to save any money. That is one thing that I hope that Universal improves. I would highly recommend the FRONT OF LINE pass. This was a fantastic feature! We actually went to the front of every line except for the 2 Harry Potter rides. They don’t offer that feature. 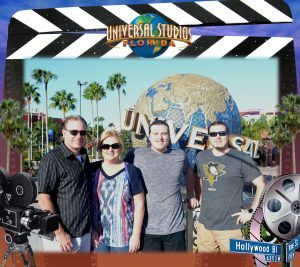 Our first day was spent at Universal Studios. We planned to take it easy and make our vacation as relaxing as possible. With the Front of the Line pass, we were able to do just that. We strolled, leisurely through the park. And still did everything that we wanted to do. If you’re looking for thrills and great action, Transformers 3D has it all! 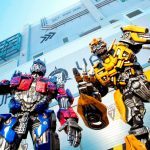 In this attraction, you ride along with the transformers and help them battle the Decepticons. There is some spinning but the visual is timed perfectly not to cause motion sickness. 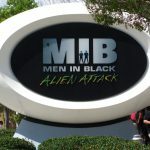 If you love Buzz Lightyear in Disney, you will love Men in Black. This high tech, interactive ride arms you, a new trainee, with a laser gun to help zap the aliens. It’s fun to compete against your family for the best score! I was really impressed with Terminator 2-3D. This attraction mingles a movie and live action thrills. Everything is timed perfectly and you even get to see Arnold save John Connor! This one is a bit loud and may scare small ones. Another favorite was Revenge of the Mummy. 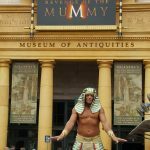 The Mummy comes to life as you race through the tombs. This is a great indoor coaster! Can you survive the curse??? The most popular and crowded area was Diagon Alley. 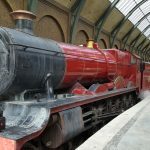 It IS a wonderful world of Harry Potter including shops, restaurants and great attractions. And EVERYONE wants to see it all. Upon arrival, we headed straight for Olivanders Wand Shop. When the door opens, they only take in 35 people at a time (the line is very long). There is a short show, with a magical wand that chooses its’ Wizard. After the show, you are let lose in the shop….right along with a few hundred other people! You can opt out of the show and enter the store through the side door. 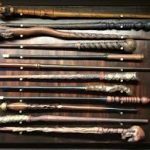 The store has thousands of wands lined up from floor to ceiling. They all vary in design, weight and material. You can even tell the Wizard your birthday and he will tell you which one to pick. There are interactive wands for $47. They allow you to preform “magic” in the 2 Harry Potter parks. While there are less expensive regular wands, they aren’t as fun. Of course, when you’re in this area you have to try a Butter Beer. This is a tasty treat that has a wonderful foam on top. 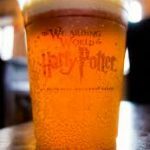 You can get a regular butter beer, frozen or hot. We tried regular and frozen and they were both really good. It had a taste similar to a piece of butterscotch candy. One of our favorite rides was Escape from Gringotts. The line was pretty lengthy but the scenery along the path is great! 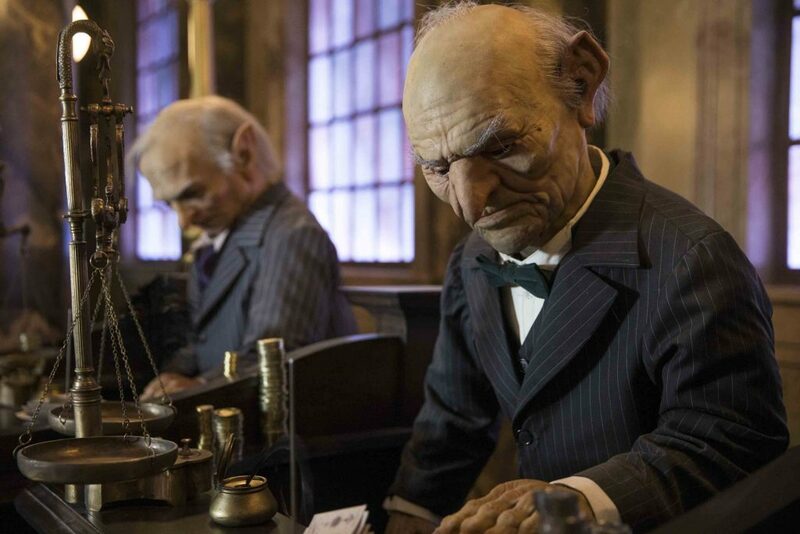 You enter the bank’s grand marble lobby and watch the goblins hard at work. The ride, itself, has you flying through the vaults trying to avoid the security. Again, the movie and motion was timed well enough to not cause any motion sickness. Some important tips that I’d learned about this area and Hogsmead is to try to visit it later in the day. It seems to be less crowded. These parts of the park do not have much open space. It is closed in and tight in some areas. Early in the day, there are walls of people. I am a bit claustrophobic and I was a little uncomfortable. The buildings are tall and you are really packed in. Along the edges are the “magic wand” areas. People are waiting in lines to try out their wands. Another tip is to eat before or after you visit these areas. There isn’t a lot of food choices and again, everything is really crowded. If you plan to visit Hogsmead by Hogwart’s Express, you will need a Park to Park pass. All in all, we really enjoyed Universal Studios. 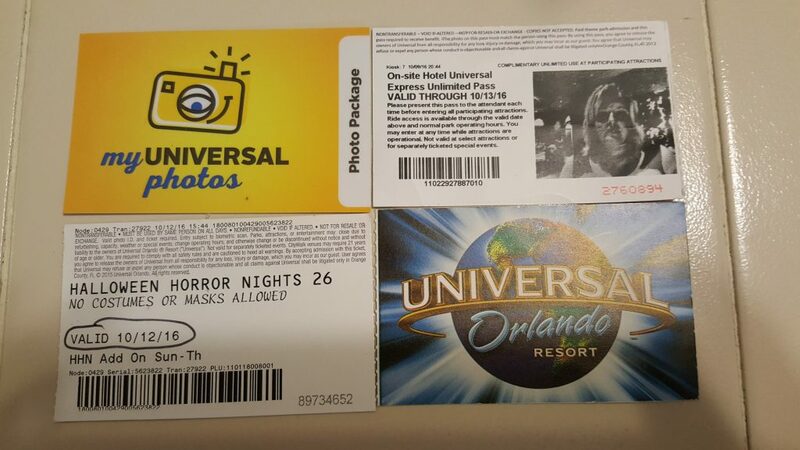 Next month, I will tell you about our experiences in Islands of Adventure. This is the second park at Universal Orland. It’s filled with lots of fun and thrills! In the meantime, if you would like more information, contact one of the Travel Pixies at OLP Travel.